Inner Rambling of a Mid Life Mama. : Corner View...Sweets. making your hips as wide as a house and your chins multiply. So I don't really very often do sweets. I do like a lovely yummy bowl of ice cream now and again. beach town and order me a Knickerbocker Glory!!!! five years old this is HEAVEN in a big fancy glass!!! it's still my little Corner View from my inner five year old. I know they'll all be coming up with something fabulous this week!!! I'm sorry, did you say you DIDN'T like sweets?????? Wow. What do you eat then??? Wow! I must admit that I'd take ice cream any day over a cookie. (I'm not big on sweets either.) I think I eat as much ice cream in winter as in summer. Happy Corner View day. heaven in a big fancy glass!! now that's sweet. Aaaargh! 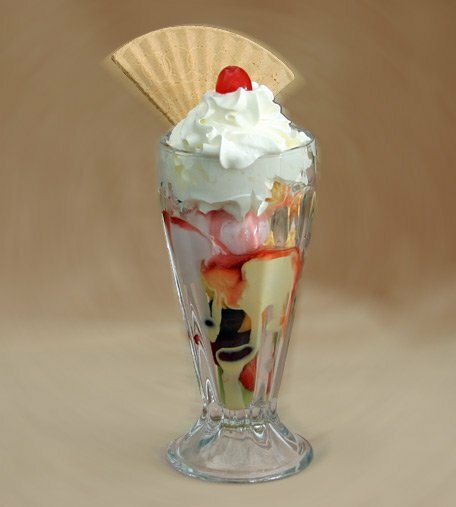 Just after I resolve to go on a diet and go to the gym more, I see your picture of a Knickerbocker Glory! I used to live for those! You're in good company, by the way: George Washington was obsessed with ice cream, believe it or not. that looks so good! I will NOT be looking at any of the others takes on "sweets" because that is way too tempting. I am too weak and love all sweets. I'm gonna go get some icecream now. it´s a work of art! Um - that would be heaven in a glass when you're 40 years old - never mind 5. YUM...there goes the good food diet I've been on....a trip to dairy queen is needed ! Sweets! The love of my life ( shhh, don't tell my wife ). Ice cream is my weakness, my achilles heel, my arch enemy.